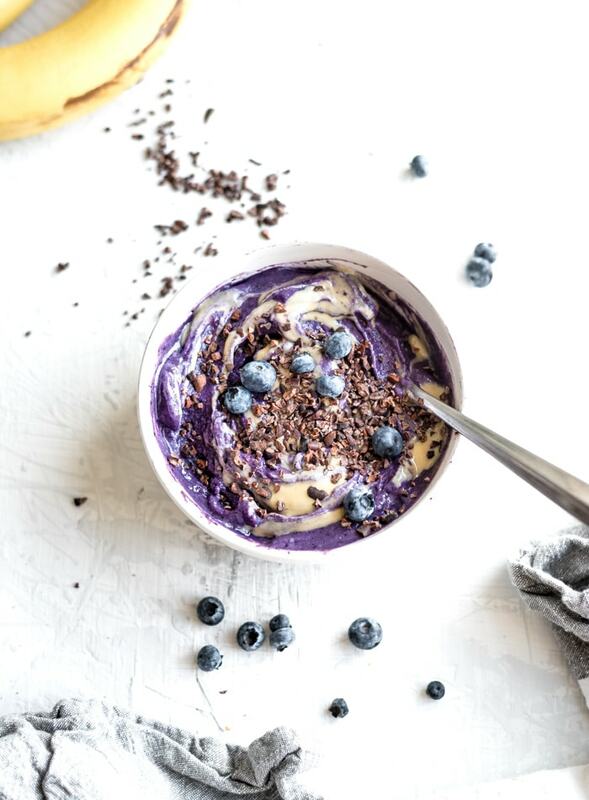 This purple banana nice cream uses just half a frozen banana. The rest is made from purple yam, zucchini, blueberries and plant-based vanilla protein powder. This take on soft-serve ice cream is part smoothie and part ice cream but all it’s delicious and full of nutrition. This recipe is high in protein, vegan, gluten-free and low in sugar. What is Banana Nice Cream? Nice cream is just internet-speak for ice cream made from bananas, made cruelty-free as an alternative to dairy. Typically nice cream is made from just one ingredient: frozen bananas. Blend those up and you’ll have thick, soft-serve ice cream that’s sweet, creamy and the perfect way to satisfy an ice cream craving. Once you’ve got a base of frozen bananas though, you can really start to have some fun. You can mix in peanut butter for peanut butter ice cream or a couple spoonfuls of cacao powder for chocolate ice cream, or combine those two for chocolate peanut butter. You can mix in other fruits such as mango, peach or strawberry to create fruity flavours. You can add vanilla or chocolate protein to up the protein content. You can add cacao nibs and mint for mint chocolate chip ice cream. You can mix in some crumbled no-bake cookie dough balls to make a cookie dough blizzard. There’s really no end to what you can create. Purple yam or ube is a type of yam that’s bright purple in colour. They can be cooked and eaten the same way you would a regular yam or sweet potato. The bright purple colour comes from their anthocyanin and antioxidant content making these beauties a nutrient-rich food to add to your diet. A well-stocked grocery store should carry them but the may not always be avaiable in your area. If you can’t find any for this recipe, you an substitute sweet potato, yam or Japanese yam, which have white flesh instead of orange or purple. 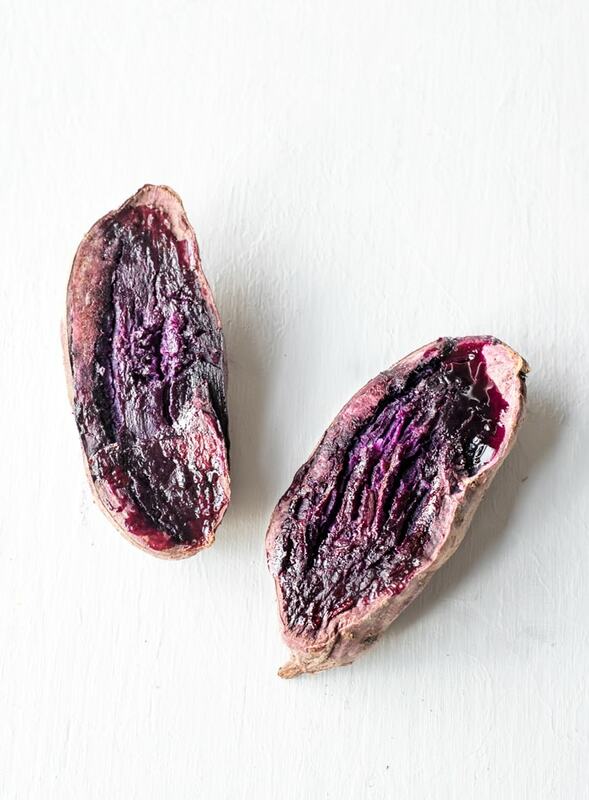 The anthocyanins found in purple yam can help reduce high blood sugar, have anti-inflammatory properties, help protect the liver and can also reduce oxidative stress and pro-inflammatory cytokine secretion after exercise making them an excellent food for athletes. 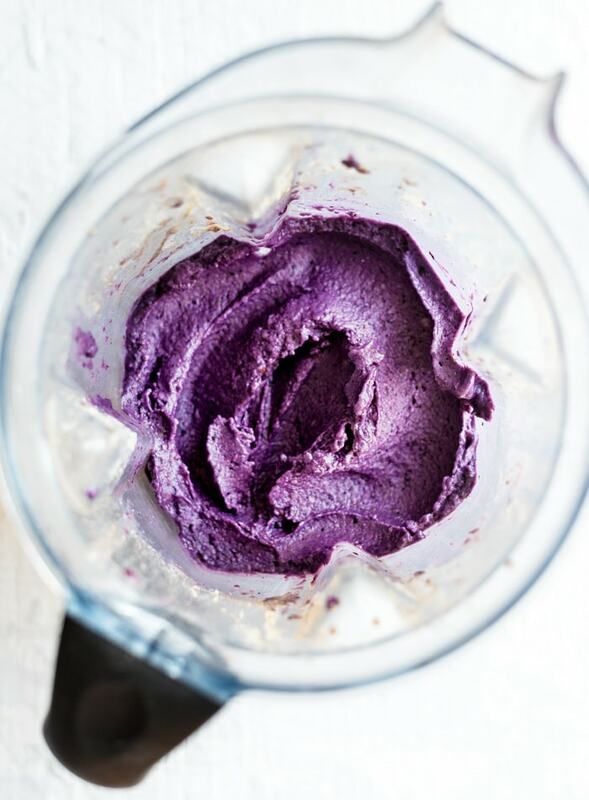 This article covers many studies done on the purple yam but to sum it up, their high antioxidant content makes the ube a powerful food for anti-aging, cancer-prevention, reducing blood sugar and insulin spikes, liver health, controlling hypertension and more. Their high-fibre content also means they can help promote a feeling of fullness, curbing urges to overeat. A diet high in dietary fibre has also been shown to help reduce cholesterol, help manage blood sugar levels and improve digestion. To make a decent-sized bowl of nice cream, you need at least one large frozen banana or a couple small ones. I don’t usually want to eat that much banana at once and I’m always down for a way to sneak more green veggies into my diet, so this purple banana smoothie bowl situation is getting the volume pumped up with zucchini and blueberries. You’ll need purple yam, frozen blueberries, frozen zucchini, almond milk and vegan vanilla protein to make it. With these ingredients you’ll be able to enjoy a nice big serving that’s loaded with nutrition but low in sugar and balanced with some added protein. If you want to add a little fat to it, you can blend in 1-2 tbsp of almond butter for extra flavour and creaminess. Blender. You’ll need a half-decent blender or some patience to make this recipe. I used my Vitamix which was no issue but you’ll need the tamper to keep pressing things down. If you don’t have a blender with a tamper, you’ll have to stop frequently to scrape everything down. Keep it on the lowest speed until you have a very thick, smooth ice cream-like consistency. Liquid. I used just 1/2 cup of almond for the liquid in this recipe. With a Vitamix it was no problem to get it to blend. With 1/2 cup liquid you’ll end up with thick nice cream. If your blender isn’t quite up to the job you may need a little more liquid to get it to blend. If you find it just won’t blend with 1/2 cup, slowly start adding more until it blends. No worries if it’s a little thinner, it will just be more like a creamy smoothie bowl than thick ice cream. Sometimes I like adding a bit more liquid, both ways are delicious. Zucchini. I used raw, peeled, chopped and frozen zucchini in this recipe. If you have any digestive issues, I’d recommend steaming the zucchini before freezing to improve digestibility. Peeling them can also help with this however you can also leave the peels on if that’s okay for you. You can also use fresh zucchini if you want to make this and don’t have any frozen on hand. Frozen zucchini will add to the creaminess and has a really nice texture once blended but fresh is totally fine too. Protein. I wouldn’t recommend leaving the protein out of this recipe. I used a vanilla plant-based protein powder for flavour, sweetness, thickness and added protein. Some brands I like are SunWarrior, Vega, Iron Vegan, Orgain, NuZest and North Coast Naturals. If you really don’t want to add protein, I’d suggest adding more frozen banana, dates or another natural sweetener in it’s place. Okay, so this recipe is very easy to make. 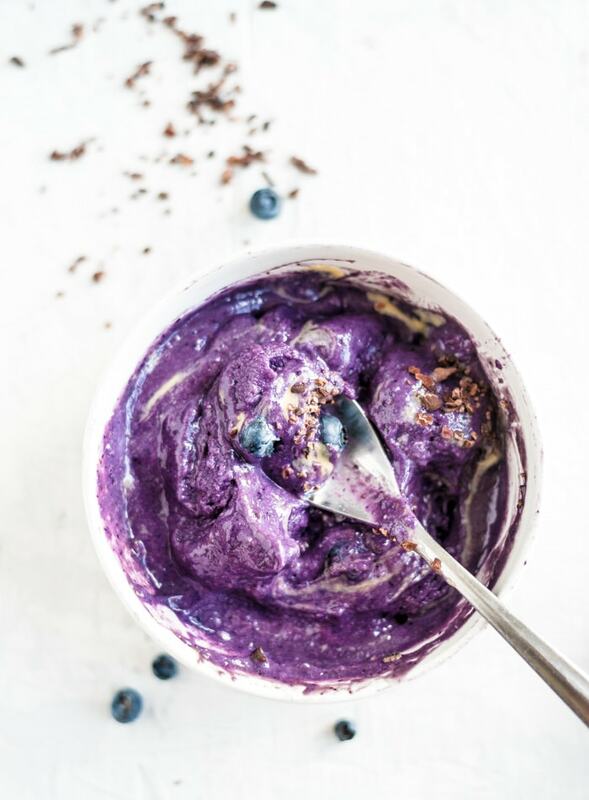 It lands somewhere between a smoothie bowl and banana nice cream but it’s all delicious, super creamy, bright, beautiful and purple and you will love it! I love the flavour and texture but what I really love is all the nutrition it packs in. I mean, you’re pretty much eating salad with all the veggies in there. 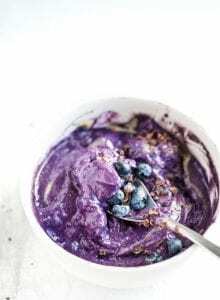 Plus with the antioxidant-rich purple yam and blueberries this smoothie bowl is a anti-aging, anti-cancer, anti-inflammatory powerhouse. For more recipes like this check out my Low-Sugar Blueberry Coconut Smoothie Bowl, Low-Sugar Chocolate Avocado Smoothie Bowl, Blueberry Banana Smoothie Bowl or Green Smoothie Bowl with 2-Ingredient Raw Granola. For adding more goodness to this smoothie, check out the best superfoods to add to smoothies. 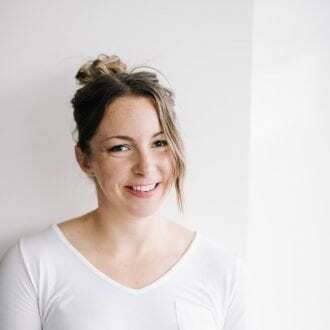 One serving of this recipe provides 350 calories with 57 grams of carbohydrates, 28 grams of protein, 3 grams of fat and 12 grams of dietary fibre. You’ll also be getting of your 31% daily iron, 31% of your daily calcium, 100% of your daily vitamin C and of your 20% of your daily vitamin A (beta-carotene). It’s also contains phosphorus, magnesium, vitamin K, zinc, manganese, B vitamins, antioxidants and has anti-inflammatory properties. This thick and creamy banana nice cream lands some between soft serve and a smoothie bowl but whatever you want to call, it’s delicious either way. You can enjoy it right away or spread it into a loaf pan and freezer for a harder ice cream. Try it topped with granola, cacao nibs and almond butter for a special treat! Add all ingredients to a high-powered blender and blend on low, using a tamper to press everything down or stopping to scrape down the sides, until it’s thick, smooth and creamy. You’ll need a bit of patience for this but it should come together in 1-2 minutes at the most. If needed, you can slowly add a bit of extra almond milk until you’re able to blend it. 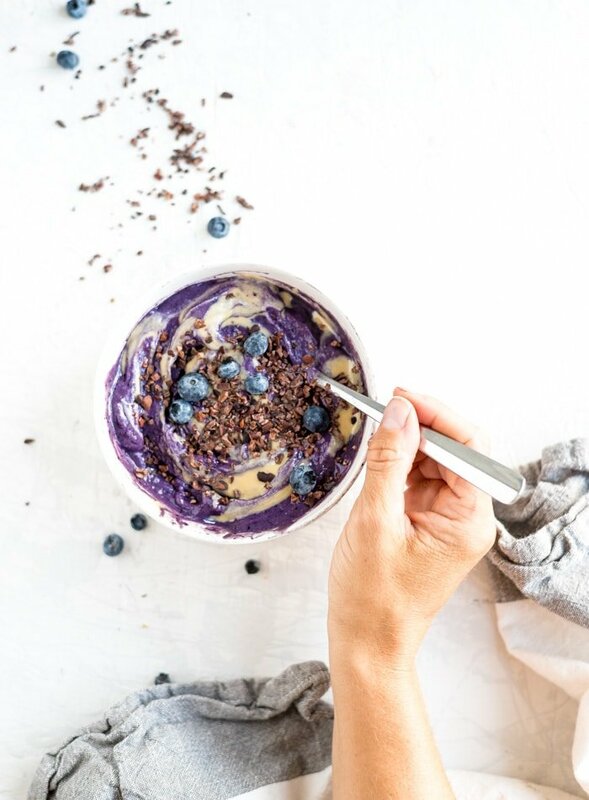 Scoop it into a bowl and enjoy as is or top it with your favourite ice cream and smoothie bowl toppings such as nut butter, cacao nibs, hemp seeds and granola. Yes, they’re the best!! I love them. I’m in love with this purple colour too. Soo pretty!